Audio Technica is a Japanese electronics manufacturer – they make all sorts of premium-quality goods, including microphones, turntables, and more. AT was around since 1962, and they’ve earned numerous awards for their unparalleled craftsmanship. Now, they’re among the top brands when it comes to on-stage equipment, which is the reason why we’ve picked ATR2500 and AT2020 for our little comparison. As we go on, you’ll notice that there are numerous similarities and differences between these two models – since they both come from the same brand and boast exceptional value for the buck, we’re here to figure out which one is better on the long run. The ATR2500 is an exceptional microphone – it features USB connectivity, a huge frequency range (even broader when compared to AT2020), and a fairly balanced EQ. Monitoring its functions is all too easy due to embedded jack for headphones outfitted with fully adjustable volume controls, but that’s hardly all there is to it. Just like AT2020, the ATR2500 is a cardioid-pattern microphone which reduces the incoming (unwanted) signals from back and sides. While it’s pretty quiet on its own, you might want to consider juicing it up with extra phantom power. It’s great for recording and live performances, although it does come at a hefty price (still cheaper than AT2020). Basically, AT2020 is a condenser microphone which comes with an XLR cable, a sturdy all-metal chassis, and a huge frequency response. It sounds absolutely ravishing, boasting all-around performance and pristine clear audio emissions. With the cardioids pattern, it can receive frequencies at approximately 180 degrees, making it suitable for overhead recording. On top of that, it features USB connectivity, just like AT2500. A microphone as good as AT2020 shouldn’t be considered by people who won’t be able to utilize its superb features and performance – it’s best for professionals and people who rely on bleeding-edge technology to get the most from their songs/recordings. It’s not that expensive, but it certainly doesn’t come cheap. There are plenty of similarities between ATR2500 and AT2020. The first, most obvious one is that they’re made of similar, exceptionally rugged materials. Durability won’t be an issue for you regardless of which model you pick, and that’s a major understatement. Secondly, both of these microphones feature USB connection and headphone jacks, allowing you to monitor your recording sessions live without any latency or lag. On top of that, they both have a neutral (unobstructed) sound signature. The last, and for some the most important similarity between these microphones is that they both belong to the same price point category (medium bracket of the “moderately expensive). The AT2020, however, is a couple of bucks more expensive though. Even though they’re made by the same manufacturer (and belong to generations which are pretty close by), there are several differences between AT2020 and ATR2500 we should point out. Firstly, while both of these models are great for recording, the AT2500 doesn’t really excel in this field of performance. The AT2020 doesn’t come outfitted with special embedded features which would simplify the recording process, but it’s pretty versatile overall. On the other hand, 2500 which does have certain embedded features will do the job, but the end results won’t be overly impressive. Secondly, the ATR2500 has embedded volume setting controls on its front side, unlike AT2020 – this isn’t too much of a big deal, though. Thirdly, we did mention that both of these microphones are very durable, but AT2020 appears to be weaker in terms of durability – certain parts are made of cheap plastic while 2500 remains as hard as a rock. Last, but not least, ATR2500 is somewhat cheaper than AT2020 – their value for the buck, however, are pretty close by though. Both ATR2500 and AT2020 sound exceptionally great – these are professional microphones that will give you what you want in terms of sound quality, although this round goes to AT2020. The AT2500 somewhat compromises the vocal quality for the sake of other fields of performance. Now, both of these microphones are USB mics, which pretty much means that you won’t have to trouble yourself while recording your instruments, vocals, or percussions. They’re both compatible with most major operating systems, and they’re equal in the field of connectivity. That being said, this round is a draw. People who want to get a good sounding microphone under $100 will find that both ATR 2500 and AT 2020 could be found within this price range. The difference in price between these microphones is small, minor even, but it’s there – ATR 2500 is cheaper and wins this round. Rugged, durable design is what adorns both ATR 2500 and AT2020, but it’s important to note that they’re not equally sturdy. The AT2200 is tough, that’s a given, but it fails to go toe to toe with AT 2500 which is superiorly durable. Lightweight microphones are usually very easy to use, and the same can be said for AT 2020 and ATR 2500. However, the latter features embedded volume setting controls and performs better when if you don’t intend to use XLR, so it appears to be easier to use than the former. PROS: Great sound quality / Don’t have to buy a pop filter as long as long as the mic is not too close to your mouth / Very sturdy / Background noise cancellation / Plug and Play. PROS: Clear natural sound / Metal body / Good mid-range quality. CONS: LED light stays after the computer is off / The stand is a bit flimsy / no turn-off button. CONS: Doesn’t come with the stand / You have to buy an audio interface if you don’t own one. Objectively, ATR2500 is cheaper, easier to use, and just a bit more durable. On the other hand, AT2020 promises better sound quality, boasts a broader range of response, and most studio sound editors claim that it performs better for recording than ATR2500. Even if that might be true, it would be tough to declare the victor based on these minor differences. The fact is that both ATR2500 and AT2020 are phenomenal cardioid microphones. What’s more, they’re both in the price range below $100, so even if they might not be the best mics ever made, they’re still incredibly great for the buck. 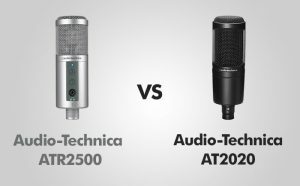 The only thing which made us think that AT2020 is better than ATR2500 is the fact that it performs better in terms of recording, regardless of the environment.